Amersham ear wax removal at the Chalfont hearing centre Bucks. If you are suffering from blocked ears, excessive ear wax and need this the be relieved then please call our Chalfont or Henley centres for an appointment. Leon Cox the lead audiologist can assist in ascertaining the ear wax issue and clear the ear blockage. Using Microsuction for the ear wax removal is the simplest and easiest way although if preferred we can use the traditional water irrigation technique. If you need or want a hearing test this also can be conducted at the either branch, along with information on the very latest digital hearing aids by the major manufacturers. The Chalfont hearing centre is a premium independent hearing centre serving the whole of Buckinghamshire. Chalfont ear syringing available now! Chalfont ear syringing or ear wax removal. The Chalfont hearing centre is an independent hearing centre run by Leon Cox and are based in Little Chalfont. To get an earlier appointment for your ear wax removal or your hearing test please book as soon as possible. Chalfont hearing centre are also a major Buckinghamshire centre for the latest DIGITAL hearing aids. If you are suffering with hearing loss and need impartial expert advice them please reception to book your appointment to speak with Leon. A review of the rationale for and enhanced features in AutoSense OS 3.0 with binaural signal processing, and how the new system is designed to achieve the most appropriate settings for the wearer, optimising hearing performance in all listening environments, including media steaming. It can be challenging to hear, understand, and actively engage in conversation in today’s fast-paced and “acoustically dynamic” world, especially for a listener with hearing loss. The Phonak automatic program has been designed to adapt seamlessly, based on the acoustic characteristics of the present environment and the benefit for clients. 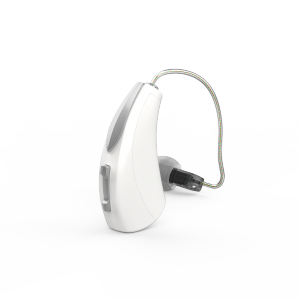 AutoSense OS™ 3.0 is the enhanced automatic operating system in Phonak Marvel™ hearing aids. It has been optimised to recognise additional sound environments for even more precise classification, applying dual path compression, vent loss compensation, and a new first-fit algorithm. In combination, these new enhancements to the Phonak automatic classification system ensure that the listener gains access to speech clarity and quality of sound irrespective of the environment, enabling them to actively participate in everyday life. Without conscious effort, humans naturally classify audio signals throughout each day. For example, we recognize a voice on the telephone, or tell the difference between a telephone ring versus a doorbell ring. For the most part, this type of classification task does not pose a significant challenge; however, problems may arise when the sound is soft, when there is competing noise, or when the sounds are very similar in acoustical nature. Of course, these tasks become even more difficult in the presence of a hearing loss, and hence, great strides have been made in hearing instrument technology to incorporate classification capabilities within the automatic program. In previous years, the sound processing of hearing aids was limited to a single amplification setting used for all situations. However, since the soundscape around us is dynamic—with frequent acoustical changes in the environment—it is unrealistic for a hearing aid with only one amplification setting to deliver maximum benefit in every environment. The evolution of hearing aids has seen the introduction of sound-cleaning features, such as noise cancellation, dereverberation, wind noise suppression, feedback cancellation, and directionality. These features offer maximum benefit to overall sound quality and speech intelligibility when they are appropriately applied, based on analysis of the sound environment. Rather than having these sound-cleaning features permanently activated, their impact is greatest when they are applied selectively. For example, a wearer may not hear oncoming traffic if noise cancellation is permanently suppressing sound from all directions. Thus, defaults are set in the system for different environments. Figure 1. 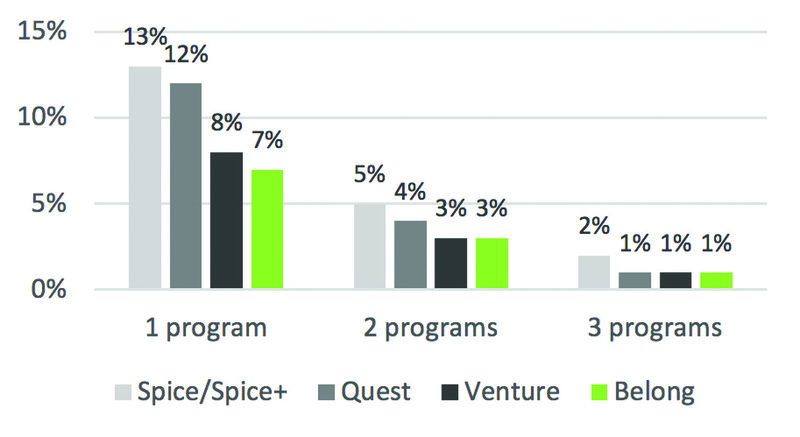 Market research data from Phonak in 2017: Percentage of fittings with manual programs at 2nd session across hearing aid platforms Spice/Spice+, Quest, Venture, and Belong (n = 183,331). Results of studies focusing specifically on speech intelligibility demonstrate that the majority of participants achieve a 20% improvement in speech understanding while listening in AutoSense OS than in a “preferred” manual program across a wide variety of listening environments, suggesting that manual programs may not always be appropriately or accurately selected.4 Even more interesting is the fact that users rate sound quality as being equal between the automatic and manual programs.5 According to this same research from Searchfield et al,5 a possible explanation may be that the practical application of selection relies on the wearer’s manual dexterity, normal cognition, noticeable benefit, and motivation levels. Furthermore, their research confirms a bias towards selection of the first program in the setup—whether or not this would be considered “audiologically” optimal. Having an automatic program which can seamlessly adjust to select the most appropriate settings in any environment therefore saves both the client and the hearing care professional effort, time, and hassle. When Phonak AutoSense OS was originally developed, data from several sound scenes was recorded and used to “train” the system to identify acoustic characteristics and patterns. These characteristics include level differences, estimated signal-to-noise ratios (SNRs), and synchrony of temporal onsets across frequency bands, as well as amplitude and spectrum information. Probabilities of the degree of match between “trained” versus “identified” acoustic parameters in real time are then calculated for the most optimal selection of sound settings in each environment. There are seven sound classes: Calm Situation, Speech in Noise, Speech in Loud Noise, Speech in Car, Comfort in Noise, Comfort in Echo, and Music. Three of the programs—Speech in Loud Noise, Music, and Speech in Car—are considered “exclusive classes” (ie, stand-alone) while the other four programs can be activated as a blend when it is not possible to define complex, real-world environments by one acoustic classification. For example, Comfort in Echo and Calm Situation can be blended with respect to how much each of these classifications are detected in the environment. With AutoSense OS 3.0, Phonak has gone a step further and incorporated data from even more sound scenes for the classes Calm Situation, Speech in Noise, and Noise into the training for additional system robustness. Enabling the desired signal processing is the goal of automatic classification, so to support the wearer’s understanding in speech-in- noise situations, the program Speech in Noise is activated even earlier than before. AutoSense OS 3.0 is the foundation for steering the signal processing and applying the most appropriate setting for the wearer based on the acoustics present in the environment. Refinements to the audiological settings within this are always sought to further enhance the user experience, and the improvements occur in different areas of the signal processing. It is known that a full and rich sound is preferred by wearers while streaming audio, so the system enhances the sound quality of streamed audio signals by increasing the vent loss gain compensation. The result is an increase in low-frequency gain by up to 35 dB, which is especially beneficial to overcome the vent loss of a receiver-in-canal (RIC) hearing aid, most likely to be fitted with an open coupling (depending on the hearing loss and/or client comfort). This low-frequency “boost” is applied to streamed signals (or any other alternative input source, including a telecoil), while inputs received directly to the hearing aid microphones remain uncompromised, maintaining the frequency response of a Calm situation. Listening to music and enjoying it is achieved by an alternate setting that is used to attain optimal speech understanding. In an internal study conducted at the Phonak Audiology Research Center (PARC), participants emphasized their preferences for clarity of speech for dialogue-dominated sound samples and sound quality for music-dominated samples (C Jones, unpublished data, “Preferred settings for varying streaming media types,” 2017). This preference applies not only in the acoustic environment where signals reach the hearing instrument microphones directly, but also for streamed media inputs via the Phonak TV Connector or Bluetooth connection to a mobile device. Phonak Audéo Marvel with AutoSense OS 3.0 now incorporates streamed inputs into the automatic classification process offering the wearer speech clarity as well as an optimal music experience. 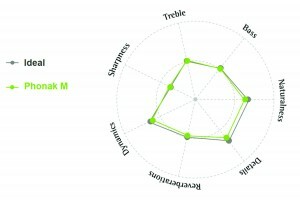 A recent study conducted at DELTA SenseLab in Denmark confirmed that the new Audéo Marvel, in combination with the TV Connector, is rated by wearers as close to their defined ideal profile of sound attributes for streamed media across a range of samples including, speech, speech in noise, music, and sport (Figure 2). The Audéo Marvel streaming solution was also rated among the top streaming solutions across 7 competitor solutions.8 This confirms that the way in which the classifier now categorises streamed media into the sound classes “Speech” versus “Music” is yet another way in which the system provides ideal hearing performance for wearers in their everyday lives. Figure 2. 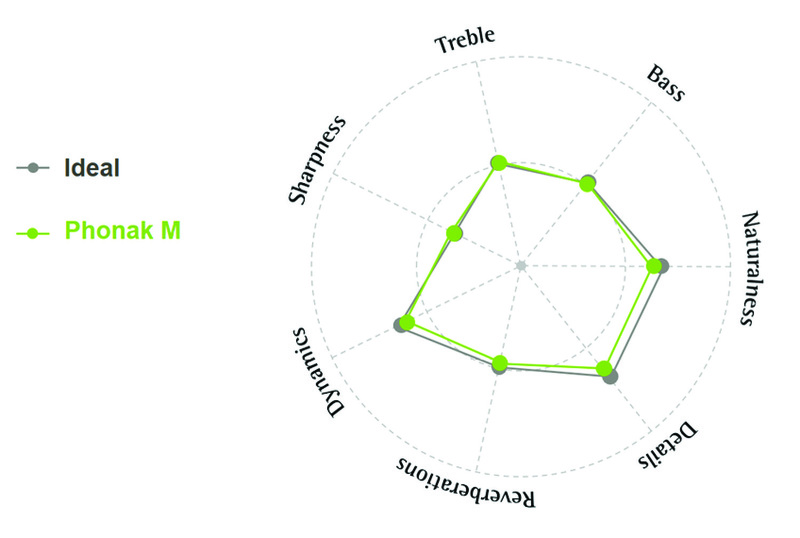 Sound attributes plot for Ideal profile (in gray) & AutoSense OS 3.0 in Phonak Audéo Marvel with TV Connector (in green). The Binaural VoiceStream Technology™ has been reintroduced within AutoSense OS 3.0. This technology facilitates binaural signal processing, such as binaural beamforming, and enables programs and features such as Speech in Loud Noise (when StereoZoom™ is activated), Speech in 360°, and DuoPhone. StereoZoom uses 4 wirelessly connected microphones to create a narrow beam towards the front, for access to speech in especially loud background noise. We know that the ability to stream the full audio bandwidth in real time and bidirectionally across both ears improves speech understanding and reduces listening effort in challenging listening situations.9 This reduction in listening effort, and consequently, memory effort, has been demonstrated in recent studies employing electrophysiological measures, such as electroencephalography (EEG), where significantly reduced Alpha-wave brain activity is noted when listening with StereoZoom compared to listening with more open approaches of directionality.10 When we consider this in terms of the “Limited Resources Theory” described in psychology by Kahneman11(ie, that the brain operates on a limited number of neural resources), it highlights that efficiencies in sensory processing, through use of such advanced signal processing, may serve to free up resources to benefit higher cognitive processing for the wearer. The ability of a hearing instrument to offer acceptable “hands-free” listening by automatically adapting to multiple situations increases the adoption rate of the instrument.1 The enhanced AutoSense OS 3.0, with binaural signal processing, achieves this by selecting the most appropriate settings for the wearer, optimising hearing performance in all listening environments, and now during media streaming, too. The wearer is freed from expending energy on effortful listening and can focus their enjoyment instead on tasks which are more meaningful to them, confident in the knowledge that their hearing instruments will automatically take care of the rest. 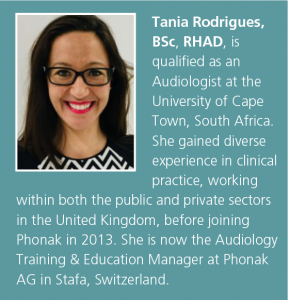 Citation for this article: Rodrigues T. A new enhanced operating system in Phonak hearing aids: AutoSense OS 3.0. Hearing Review. 2019;26(2)[Feb]:22-26. Kochkin S. MarkeTrak VIII: Consumer satisfaction with hearing aids is slowly increasing. Hear Jour. 2010;63(1):19-32. Rakita L; Phonak. AutoSense OS: Hearing well in every listening environment has never been easier. https://www.phonakpro.com/content/dam/phonakpro/gc_hq/en/resources/evidence/white_paper/documents/insight_btb_autosense-os_belong_s3_028-1585.pdf Published August 2016. Überlacker E, Tchorz J, Latzel M. Automatic classification of acoustic situation versus manual selection. Hörakustik. 2015. Rakita L, Jones C. Performance and preference of an automatic hearing aid system in real-world listening environments. Hearing Review. 2015;22(12):28-34. Searchfield GD, Linford T, Kobayashi K, Crowhen D, Latzel M. The performance of an automatic acoustic-based program classifier compared to hearing aid users’ manual selection of listening programs. Int J Audiol. 2017;57(3):201-212. Gatehouse S, Naylor G, Elberling C. Linear and nonlinear hearing aid fittings-1.Patterns of benefit. Int J Audiol. 2006;45(3):130–152. Jansen S, Woodward J; Phonak. Love at first sound: The new Phonak precalculation. https://www.phonakpro.com/content/dam/phonakpro/gc_hq/en/resources/evidence/white_paper/documents/insight_btb_marvel_precalculation_season4_2018_028-1931.pdf. Published July 2018. Winneke A, Appell J, De Vos M, et al. Reduction of listening effort with binaural algorithms in hearing aids: An EEG study. Poster presented at: The 43rd Annual Scientific and Technology Conference of the American Auditory Society; March 3-5, 2016; Scottsdale, AZ. Winneke A, Latzel M, Appleton-Huber J; Phonak. Less listening- and memory effort in noisy situations with StereoZoom. https://www.phonakpro.com/content/dam/phonakpro/gc_hq/en/resources/evidence/field_studies/documents/fsn_stereozoom_eeg_less_listening_effort.pdf. Published July 2018. Kahneman D. Attention and Effort.Englewood Cliffs, NJ: Prentice-Hall, Inc;1973. Schulte M, Meis M, Krüger M, Latzel M, Appleton-Huber J; Phonak. Significant increase in the amount of social interaction when using StereoZoom. https://www.phonakpro.com/content/dam/phonakpro/gc_hq/en/resources/evidence/field_studies/documents/fsn_increased_social_interaction_stereozoom_gb.pdf. Published September 2018. Hearing tests in Bucks are available at the Chalfont Hearing Centre. Covering the the whole of Buckinghamshire and offers the very latest in hearing tests and other hearing related services such as ear wax removal using Microsuction and the traditional water irrigation technique (sometimes referred as ear syringing). The latest digital hearing aids would be offered after a comprehensive hearing test. These can be discussed after the test depending what your hearing loss (if any) are needed. Small in the ear digital hearing aids to the more powerful over the ear hearing aids are all available. Eargo hearing aids. Chalfont hearing centre, ear wax removal, digital hearing aids and hearing tests. Hearing aids have been getting a lot better over the years thanks to the tiny electronic hardware that can be packed inside and smart algorithms that produce great sound. Eargois a company that’s trying to introduce new features to hearing aids to make them more comfortable, easier to use, and cheaper to afford, an important issue in this field. 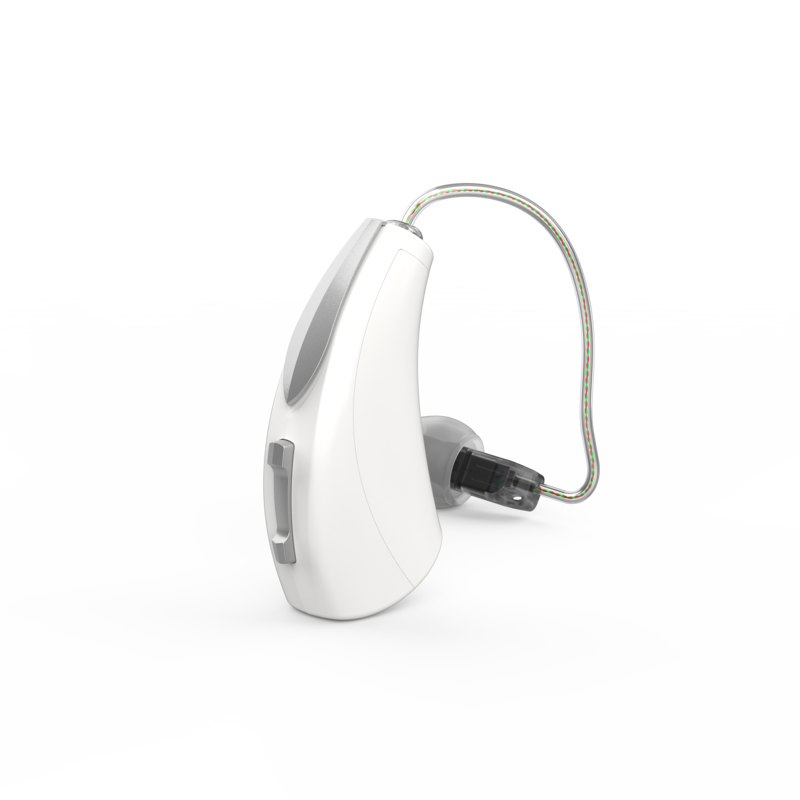 The new Eargo Neo hearing aids are almost invisible when inside the ears. They have tiny “Flexi Palms” soft tips that keep the hearing aids inside the ear comfortably while optimizing the sound quality. They have a 16 hour battery life per charge, but a recharge case can be used to refresh the Neos on the go. Something useful when taking a plane ride. Hearing centres in Bucks including the Chalfont hearing centre that cover the Amersham to the North west and Rickmansworth to the East. If you are looking for a family owned and totally independent hearing centre then look no further than the Chalfont hearing centre. Leon Cox is a highly regarded audiologist and is the lead at Chalfont. Also owns and run the Henley hearing Clinic at Henley. Reception and will gladly make you feel welcome and make sure that your are up to date with appointments and info. If you are in need of hearing aid adjustments or ear wax removal, all can be done from the Chalfont hearing centre. The British and Irish Hearing Instrument Manufacturers Association (BIHIMA) announced its release of the Q3 results of its members, providing a picture of current trends and developments within the UK and Irish hearing care markets. According to BIHIMA’s announcement, the “most significant” development is the continued growth in the number of units distributed through the private market in the UK: the number of unit sales increased by 2,756 units (3.5%) from the previous year and by 2,638 (3.3%) from Q2 2018. YTD (year-to-date) unit sales were also up 3.8% from 2017. Meanwhile, the BIHIMA reports that the NHS side of the market slowed down in the same period: unit sales were flat compared to Q3 2017 and decreased by 7445 (2.2%) from Q2 2018. YTD units were down 1.6% from 2017. 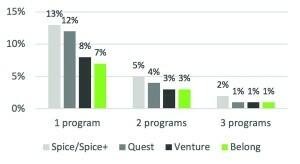 BIHIMA also tracks the trends in the types of technology being selected by patients in the private sector. In the private sector, the RITE/RIC (receiver-in-the-ear technology) continues to grow in popularity and now represents 69.4% of all sales, up 1.7% from Q3 2017. “We are seeing solid growth in the private hearing care sector which is in line with expectations based on our aging population and also points to evolving public awareness of the hearing technology produced by our manufacturers which can have transformative results,” said the BIHIMA chairman, Paul Surridge. In its role as the voice for the hearing technology industry, BIHIMA regularly monitors the market and releases the results of its members every quarter. To keep up to date with the latest market information, download the results here: https://www.bihima.com/resources/statistics/. The Chalfont hearing centre is an independent hearing company based at Little Chalfont Bucks. Family owned and run by Leon Cox, Chalfont hearing centre offer the very latest in digital hearing aids, hearing accessories and ear wax removal using Micro-Suction. With the sister site in Henley-Upon-Thames we cover the whole of Buckinghamshire. You are never far from the premier hearing company of Buckinghamshire. Amersham earwax removal by the Henley hearing clinic. Ear wax removal in the Amersham area is difficult as now the local GP’s have stopped the procedure as it is now not covered by the NHS. Leon Cox the lead audiologist at the Chalfont hearing centre is available to step in and take some of the slack in the area. Specialising in ear wax removal using the Microsuction technique or the traditional water irrigation. Apart from ear wax removal the Chalfont hearing centre also conduct hearing tests and the servicing of hearing aids. Hearing aid batteries are on sale at the centre and the dispensing of hearing aids by the leading hearing aid brands. Chalfont Hearing Centre is based at Little Chalfont Bucks and is run by Leon Cox the lead audiologist. Offering a full hearing service including hearing tests, ear wax removal (using Micros-Suction) and the fitting of the latest digital hearing aids for the Bucks area including Amersham and Beaconsfield. The Chalfont Hearing Centre can sometimes fit in early appointments through cancellations, so always ask to see if there are any early appointments needed for Ear Wax removal. Please mention this when you book an ear wax removal appointment. Widex A/S, Lynge, Denmark, the privately-owned Danish hearing aid company, has announced the launch of WIDEX TV PLAY™, a high-end TV accessory and streaming solution for WIDEX EVOKE™ hearing aids. The sleek and versatile TV PLAY received the Red Dot Design Concept Award last Friday, September 28, for its pleasing design. Widex has also been honored as a leader in innovation in the RedDot Design Ranking for Design Concepts. The company placed number 4 out of 15 companies in the Americas and Europe region in recognition of its pursuit of design excellence over the past 5 years, reports the company. Shipments of TV PLAY will start in November. A valuable accessory for hearing aid users. A 2017 Nielsen survey1 reported that the US 65+ population consumes a daily average of 6 hours and 57 minutes of TV. Despite the growing number of mobile and web-based streaming services, watching TV is more popular than ever. But for some, it’s a struggle to hear the TV. Hearing aid users can find it hard to hear the TV over the other sounds in the room. 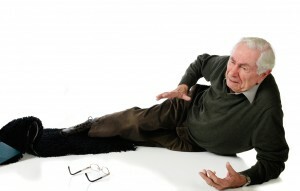 In fact, some studies suggest that 78% of hearing aid users have trouble understanding things on the TV. Designed for ease of use. According to Widex, TV PLAY lets hearing aid users enjoy great TV sound effortlessly through their hearing aids by providing direct streaming to both ears. TV PLAY is designed for fast and easy to set up, intuitive to control, and delivers outstanding and stable sound. TV PLAY drops the “boxy” look of many TV streamers and instead has a futuristic design that blends in with modern homes. And if you prefer to have TV PLAY out of sight, the slim and discrete design fits behind flat screen TVs with no trouble, according to the company. Maximum streaming stability. With Widex’s patent-pending dual-antenna technology, TV PLAY is said to offer maximum streaming stability. An easy-to-use app lets users balance the volume of the TV sound with ambient sounds and conversations—or choose just to hear the sound from the TV. The Chalfont hearing aid centre covers the whole of Buck including Beaconsfield and Amersham. Suppliers of high end digital hearing aids including hearing accessories, hearing aid batteries and ear wax removal. Leon Cox the lead audiologist at The Chalfont hearing centre is a highly experienced expert on hearing and hearing tests. Please book an appointment if you need Micro-suction ear wax removal. An international group of researchers, led by Ronna Hertzano, MD, PhD, associate professor, Department of Otorhinolaryngology-Head & Neck Surgery, at the University of Maryland School of Medicine (UMSOM), and Michael Bowl, PhD, program leader track scientist, Mammalian Genetics Unit, MRC Harwell Institute, UK, have identified the gene that acts as a key regulator for special cells needed in hearing. The discovery of this gene (Ikzf2) will help researchers better understand this unique type of cell that is needed for hearing and potentially develop treatments for common age-related hearing loss, UMSOM announced. The inner ear has two kinds of sensory hair cells required for hearing. The inner hair cells convert sounds to neural signals that travel to the brain. This compares to outer hair cells, which function by amplifying and tuning sounds. Without outer hair cells, sound is severely muted and inner hair cells don’t signal the brain. Loss of outer hair cells is said to be the major cause of age-related loss of hearing. 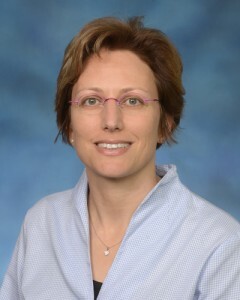 Hertzano’s group, in collaboration with Ran Elkon, PhD, senior lecturer, Department of Human Molecular Genetics and Biochemistry, Sackler Faculty of Medicine in Tel Aviv, Israel, took a bioinformatics and functional genomics approach to discover a gene critical for the regulation of genes involved in outer hair cell development. 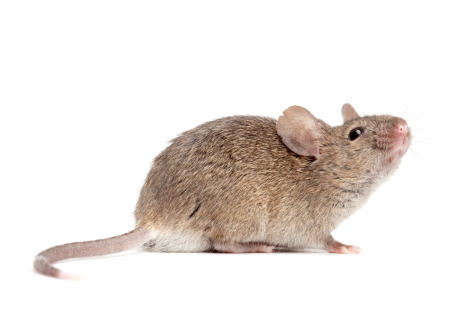 Bowl’s group studied mice from the Harwell Aging Screen to identify mice with hearing loss. Bowl identified mice with an early-onset hearing loss caused by an outer hair cell deficit. When the two groups realized that they were studying the same gene, they began to collaborate to discover its biological function and role in outer hair cell development. The gene is Ikzf2 gene, which encodes helios. Helios is a transcription factor, a protein that controls the expression of other genes. The mutation in the mice changes one amino acid in a critical part of the protein, which impaired the transcriptional regulatory activity of helios in the mice. To test if helios could drive the differentiation of outer hair cells, the researchers introduced a virus engineered to overexpress helios into the inner ear hair cells of newborn mice. As a result, some of the mature inner hair cells became more like outer hair cells. In particular, the inner hair cells with an excess of helios started making the protein prestin and exhibited electromotility, a property limited to outer hair cells. Thus, helios can drive inner hair cells to adopt critical outer hair cell characteristics. Funding for the research was provided by Action on Hearing Loss UK, the National Institute on Deafness and Other Communication Disorders (NIDCD) at the National Institutes of Health, and the Department of Defense (DOD). Original Paper: Chessum L, Matern MS, Kelly MC, et al. Helios is a key transcriptional regulator of outer hair cell maturation. Nature. November 21, 2018. Hearing solutions, Bucks, Hearing aids and earwax available at the Chalfont hearing centre near Beaconsfield and Amersham. The Chalfont hearing centre is conveniently situated between Watford and High Wycombe but covers the whole of Bucks. They also cover South Bucks and North Buckinghamshire. If you are suffering with blocked ears or think you may have ear wax issues please make an appointment with our receptionist to see Mr Leon Cox the lead audiologist. If you are in need of a comprehensive hearing test, theChalfont hearing centre can help there too. Dispensing thousands of hearing ads through their time in Bucks, Leon Cox knows a thing or two about hearing aids. The very latest digital hearing aids are available. 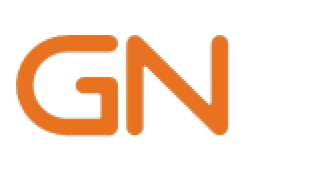 Cochlear Limited (ASX: COH), a maker of implantable hearing solutions, and GN (GN.CO), a manufacturer of intelligent audio solutions, signed a new agreement to “significantly expand” their Smart Hearing Alliance collaboration, GN announced on its website. 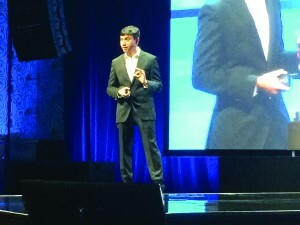 The Smart Hearing Alliance was established in 2015 to develop the most integrated, best-in-class hearing solutions—giving hearing aid and cochlear implant recipients access to the latest in connectivity and wireless technology, and helping bimodal recipients to achieve seamless connectivity between a cochlear implant in one ear, and a GN hearing aid in the other. The deepening of this relationship includes joint research and development, shared technology, and strengthened global Smart Hearing Alliance commercial collaboration between Cochlear and GN Hearing, the hearing aid division of the GN Group. Cochlear and GN Hearing are now strengthening focus on their integrated product offering and expanding their presence in the clinical hearing aid and implantable hearing solutions markets globally. According to the announcement, the vision for this new collaboration will include a focus on fast-moving connectivity and wireless technology to allow for closer integration between Cochlear and GN Hearing technologies. The two companies will leverage research and development investment to jointly develop firmware and software technologies. In addition to technology sharing, the two companies will strengthen the commercial collaboration and work together to enable clinicians to deliver a more seamless solution and best-in-class hearing experience to their patients. GN Hearing CFO Marcus Desimoni and Cochlear CEO and President Dig Howitt welcomed the signing of the expanded agreement. 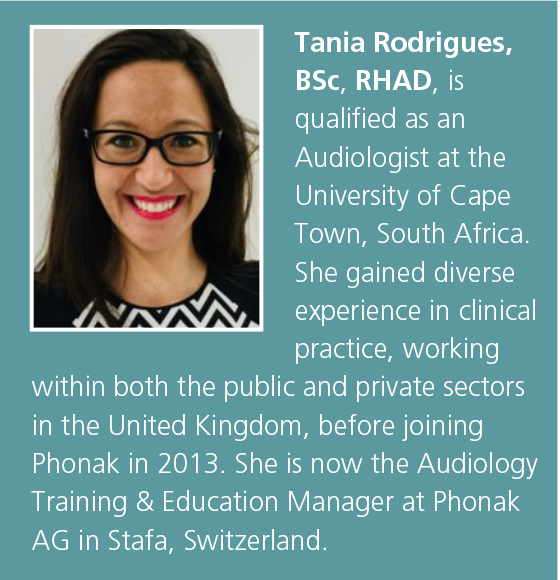 This collaboration aims to improve the hearing outcomes for more people with moderate to profound hearing loss. In developing more integrated bimodal hearing solutions, Cochlear and GN Hearing have focused on helping to achieve greater connectivity for people—not only between the two companies’ devices, but also with Apple and Android technology. Most recently, Cochlear and GN Hearing collaborated to bring to market the what is said to be the “first Made for iPhone” Smart Bimodal Solution, enabling recipients to synchronize streaming to both ears from a compatible iPhone, iPad, or iPod touch. The Nucleus® 7 Bimodal Solutionis delivered by using a Cochlear Nucleus 7 Sound Processor in one ear, a compatible ReSound hearing aid in the other ear, and a paired iPhone or iPod touch to control functionality for both hearing devices. 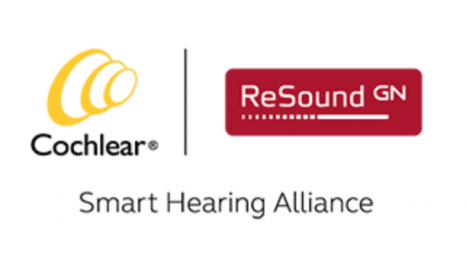 The Smart Hearing Alliance delivers bimodal solutions connecting Cochlear Nucleus cochlear implants, Cochlear Baha bone conduction implants, wireless accessories, and ReSound hearing aids.